SmokingPit.com - Bubba Gumps Style Cajun Shrimp with a Cajun Butter Sauce. 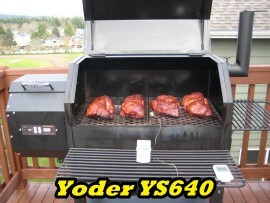 - Direct grilling on a Yoder YS640 Pellet smoker & grill. 1/2 lbs. 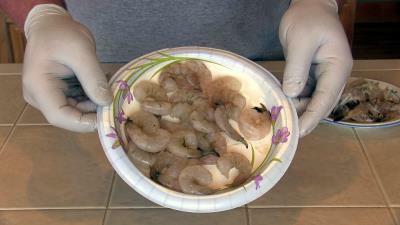 medium jumbo shrimp - De-veined and shelled. This recipe can be used as an appetizer or main course. You definitely will find it very tasty and filling. Pre-Heat your cooker for grilling. In this cook I'm cooking on a Yoder YS640 set up in direct grilling mode using Grill grates and a griddle. 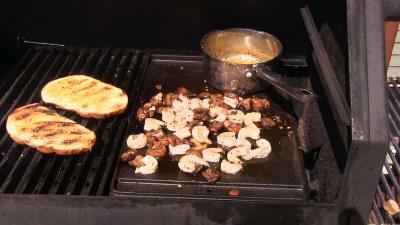 I will toast the French bread on the grill grates and sauté the shrimp, garlic and mushrooms on the griddle. 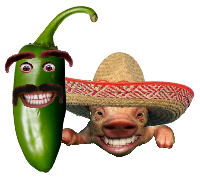 Let's get to cooking! Now let's prepare the Cajun butter sauce. In a medium sauce pan combine 1 cubes no salt butter. Trust me on the no salt butter. The flavor when complete will be amazing and not over powered by salt. 1 Tsp. ground Thyme, 1 Tsp. crushed Rosemary, 1 Tsp. no salt Mad Hunky rub, 2 Tsp. red pepper flake, 3 cloves garlic and a splash of Worcestershire. Heat over medium heat until the butter sauce is mixed and fully melted. 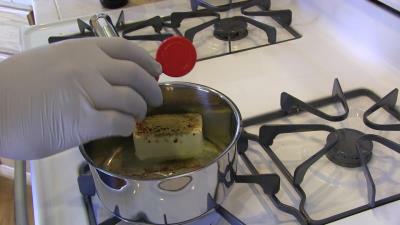 Place the sauce pan of Cajun butter sauce in a cooler place in your cooker. Place the French bread on the grates away from the fire. Spoon some Cajun butter sauce on to the griddle. Dump the mushrooms on top of the butter sauce and stir them in to the butter sauce on the griddle. After 3 to 4 minutes add the 1/2 lbs of shrimp. Check your French bread. If it done on side one then flip the bread. After you flip the bread mop some Cajun butter sauce on to the bread. Be careful to turn the shrimp and mushrooms frequently. We don't want to burn or over cook the shrimp. Once the French bread is toasted remove it from the grates but leave it in the pit to toast up and remain warm. Once the shrimp are done, cut the French bread in two. Arrange the bread in a bowl and spoon the shrimp and mushrooms over the top of the French bread. 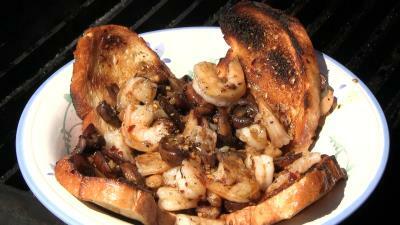 Pour the remaining Cajun butter sauce down the bread and over the shrimp and mushrooms. You ought to be drooling about now! That's it! Get yourself a cold one and sit back and enjoy. Eat it slowly and savor the flavors. Then let me know how this recipe worked for you. Smoke it! And they will come!